Solid surface offers you the best options in kitchen countertops. As the surface is smooth and non-porous, it does not allow food or liquid to sink into holes or cracks. This makes it easy to keep your counters hygienically clean and free from stains as all you need to do is wipe up the surface, using a cleaning product that is designed for the counter material. We pride ourselves on giving you lots of options to choose from. We offer stunning collections of different materials to use for your kitchen countertops. Your choice depends on your design preferences and lifestyle requirements. Discover the outstanding beauty of stone as a surface material. These countertops bring the natural beauty of stone indoors. Stone is a high-end option that boosts the value and appeal of your home. See the appeal of quartz and marble countertops in our well-stocked showroom. Quartz countertops are made from this stone with a little pigment and resin mixed in. Known as engineered quartz, this surface material has been enhanced by the manufacturing process. This process makes this a non-porous surface that gives germs and bacteria no place to hide. Find these brands in our showroom: VICOSTONE, Cambria, and Viatera by LG Hausys. Threaded with exquisite veining, marble is a coveted option for countertops. As natural stone, this material is quarried from the earth so that each individual slab is truly unique. A softer stone, marble is easier to cut and install than other harder materials. Another solid surface option is manmade laminate. Laminate countertops have the smallest price tag. Laminate is manufactured to be beautiful and strong. 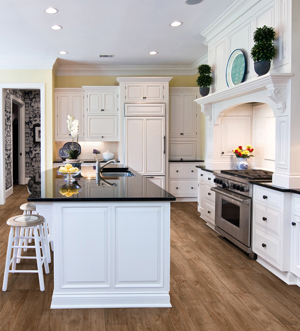 Choose laminate in styles that mimic natural materials, as well as pretty patterns or bright colors. Laminate is easy to clean and maintain and is made to last. Our local store provides you with comprehensive countertop services. We offer sales and design assistance, as well as professional countertop installation. Countertops are not easy to install as even the lighter-weight options can involve large pieces that must be cut to fit around the sink, stove, and other appliances and features. This process requires specialized training, tools, and equipment that you are not likely to have in your garage. Be sure to protect your investment when you choose to work with our skilled and experienced installers. Contact us now for your free in-home estimate on new kitchen countertops. We proudly serve the communities of Carroll, Denison, Jefferson, Harlan, and Lake View, Iowa, as well as the surrounding areas.